Fan edit created by Claudia. Check out her Facebook page by clicking the photo. This week 2012 Canadian Olympian, Victoria Moors joined us for a chat about: her legendary coach, two time Olympic Team Champion , Elvira Saadi, how long it took to learn the double twisting double layout, what really happened at Canadian Championships this year that limited her performance, what to do when your grips break seconds before you are up, upgrades, her unique bar dismount, Nutella, and her internet-famous cat, Boston. We discuss the story behind the latest investigation of rhythmic judges, the Mediterranean Games where Egyptian gymnast, Fadwa Mahmoud, tries to commit suicide by Produnova (Please read The Couch Gymnast’s series, Of Peril, Progress and Produnovas! ), routines of note from the Anadia Challenge Cup, why Max Whitlock should do air flares on pommel horse, our new favorite gymnast to watch, Hungary’s Noemi Makra, preview the University Games (get All You Need To Know About The University Games from Full Twist) and finally, the monumental injustice (according to some) of Shang Chunsong’s beam score against Larisa Iordache! Interview with Canadian Olympic Gold Medalist, Kyle Shewfelt. Interview with Canadian, Coach Rick. Correction: MyKayla Skinner is the first known woman to compete the double twisting double layout at the Fiesta Bowl meet, not Miss Moors. A summary of the many memes “Tori” has inspired by super editor, Chris Sacculo. 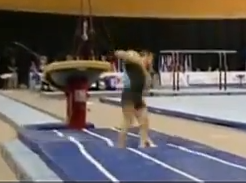 Victoria Moors’ double twisting double layout in prelims and finals at 2013 Canadian Championships. The routine that won over the audience at the 2013 American Cup. The beam routine from Canadian Championships she refers to as “doing a yoga class” after her fall. Moors’ bar routine in team finals at the 2012 Olympics. “The Moors” her eponymous dismount on bars. A terrifying Produnova from Fadwa Mahmoud. STOP THE INSANITY! Max Whitlock showing us that PH can be fun to watch! Noemi Makra on BB – 2013 World Cup Anadia. She does an onodi, front aerial, side aerial; gainer ff, layout two foot landing. Please note the bell ringer at 1:22 mark. I apologize in advance if this was already covered, I am slowly catching up (just listened to episode 8). I would like if you guys asked the guest gymnasts about their siblings. Maybe make that a standard question, just like the “most embarrassing moment” question. Hummmm, tell us more. What about them having a sibling is interesting to their life as an athlete? 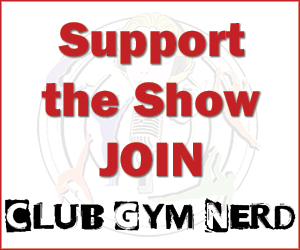 You could ask if they have brothers and sisters, older or younger, in Gymnastics or not, in other sports, etc? Hi, please, that graphic is mine.. You can write the credit? Thank you for using it ? Yup, linked through. Thank you! I love this page! My question is tho…how is it the execution score for larissa higher than for shang? I thought shangs routine was better! I dont know much about the scoring, but, is it just me?